As a resident of Texas who despises hot weather, I loathe Spring as it's the final nail in Winter's coffin. With Summer looming on the horizon, watching and waiting for its time to strike, I find myself fantasizing about Autumn and its many benefits. Namely Halloween. 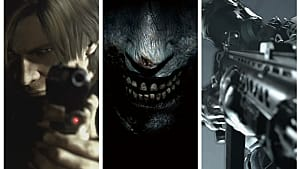 So I shut my windows, cranked up the AC, and got set to remember the most frightening moments in video games I've ever experienced -- to get into the spooky spirit. If you, too, want Halloween in March, then dive in headfirst and pretend it isn't sunny and full-of-life outside. 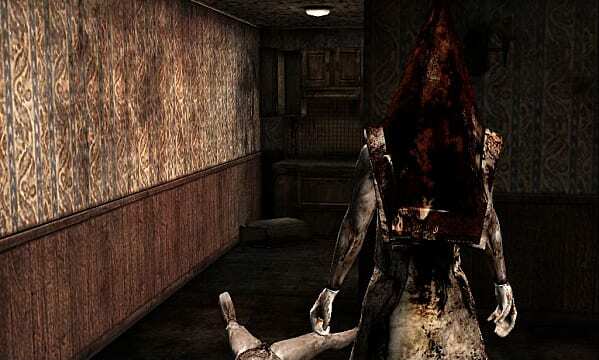 Silent Hill is easily one of the most genre-defining horror games in the history of ever. It was among the earliest to force the player into the role of an underpowered protagonist merely trying to survive against untold horror. A father, trying to find his missing daughter who has run off into the mysterious town of Silent Hill. The town itself, abandoned, and covered in a thick layer of fog is eerily stagnant yet alive. 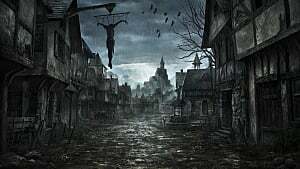 The empty buildings stand like tombstones watching over you as you meander your way through the darkness. The static you hear through your radio at the approach of an enemy always made me tense in despicable anticipation of what was to come, like the pause just before the drop of a roller coaster. 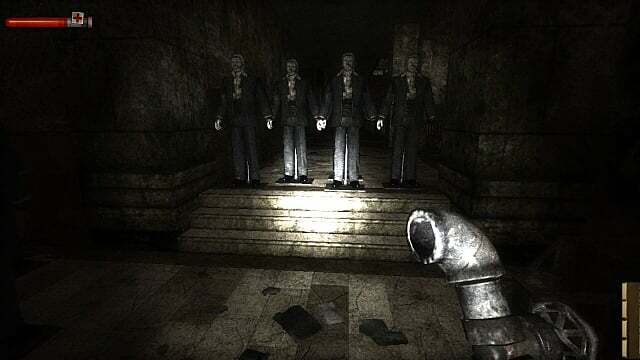 All too often were you forced to run from horrors such as the mannequin monsters with only a flashlight to arm yourself with. This game will give you nightmares and make you question the sanity of its creators when you face the endings. 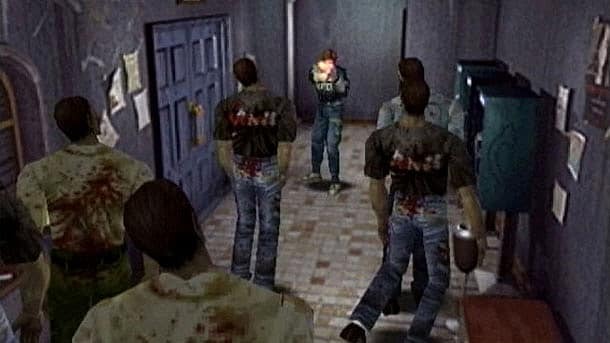 Another classic horror game, Resident Evil pits the player against zombies and other mutants, with the second installment my own personal brand of Hell. 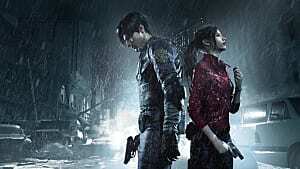 In the boots of Leon Kennedy, you find yourself in the front line of a zombie pandemic in Raccoon City and must fight your way to the station to find help. 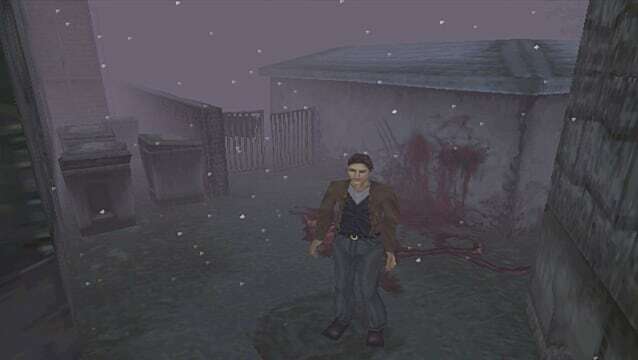 This game had the tank-like controls to make you scream in frustration, but they really added to the scare factor as you had to work harder to hit the zombies as they closed in on you. 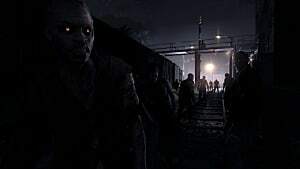 Ammo was scarce and head-shots hard to come by, creating a tense atmosphere as the undead swarmed about; slowly lumbering closer and closer. I can still remember the disgusting splashing sound effects of them feeding on a corpse nearby. Even opening a freaking door was intense as the camera entered a first person view of a door slowly opening to reveal darkness beyond it. And yes, there is a part where zombies burst through before you can move or aim. 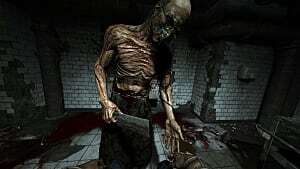 Combine that with creatures such as the skinless, ceiling-walking Licker and the room full of ravenous crows, and this game seems specifically designed to mess with the player. F.E.A.R. (First Encounter Assault Recon) was the first game in the 360/PS3 generation to make me actually yell. I saw it as just another first person shooter with nice graphics and tight, responsive controls. I got my assault rifle and my scissor kicks and felt invincible. Then I met the terrific AI of the game in the form of super soldiers and was pleased by the challenge. It was a dynamic shift compared to the games of yesteryear and I became intrigued. I fought through them and became more confident in my abilities. Then the crap hit the fan. Alma, a ghost-child with psychic abilities, begins appearing when you turn around to descend a ladder, or running past a light behind you, bathing you in her shadow. She wipes out your entire team and leaves behind nothing but skeletons soaking in a pool of scarlet. The game has more than the jumps to make you flinch and combines it with the atmosphere of knowing something amiss is nearby. The balance of gunplay against humans and exploration makes the small creepy details really build and build until the sudden appearance you’ve been dreading blows you away. 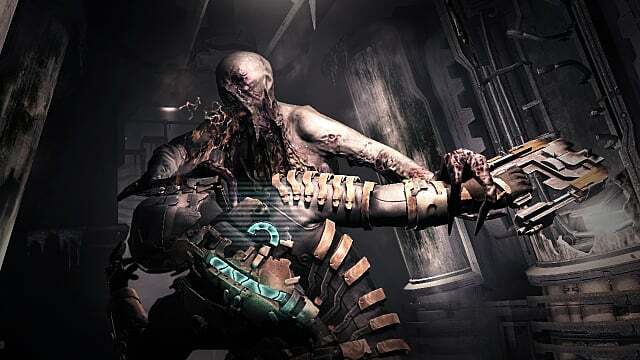 Dead Space 2 features the most unlucky man in the history of ever. 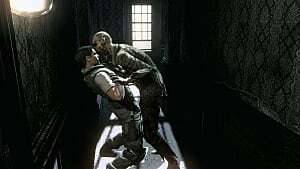 Isaac Clarke, an engineer, was sent to fix a ship, only to find the undead onboard and barely fight them off at the expense of losing both his girlfriend and his mind. Pick up a couple years later and Isaac is suffering from dementia and another tour through the pits of Hell. Once more he’s forced confront the legion of Necromorphs, only this time on a much larger and more terrifying scale. They’ve consumed an entire city, perhaps more, and he must use the information hardcoded into his brain to save it. For the player, this means you have to explore decrepit spaceships and destroyed buildings as the twisted monstrosities of Stephen King’s nightmares stalk you left and right. They will burst through walls, doors, ceilings, floors; anything they can to get to you. A fully illuminated hallway is no less frightening that a dark one when you know the monsters can come from anywhere. As horrifying as they are though, the sound is the scariest aspect of the game. You will hear a quiet, tense track of tones and strings to mellow the mood as you progress. Then you hear something scuffle away and the moans of something in pain. 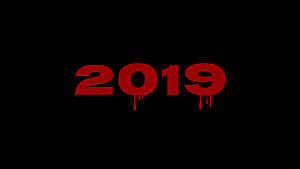 You creep into the next hallway and see blood splashed across the walls and strange runes written in it. You move closer and the strings begin to rise so slowly you don’t notice until it’s too late and the Necromorph is upon you. The roars of these creatures are a disturbing crescendo that is like night and day from the moody soundtrack. You will play this game only when feeling brave and knowing sleep isn’t that important. Especially after the needle-in-eye scene. Oh, Condemned, what can I say about you? 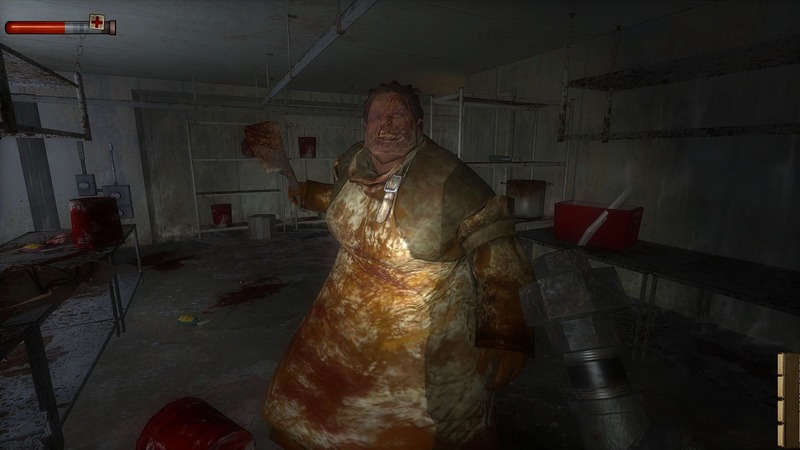 You are the pinnacle of what scares me in a video game. You are the epitome of fright and the physical manifestation of the horror that can grow within someone’s mind. As federal agent Ethan Thomas, you must track down a serial killer who has framed you for the death of your partner through the seediest city since downtown Detroit. Psychopaths await you both in groups and alone, making their tactics so varied they’re nearly impossible to predict. Some will wait under trash or behind obstacles to ambush you. Others will charge in head on with a more powerful weapon such as the fire axe. Then there are the special enemies that change from location to location, with my favorite being the ones in the mall who pose as mannequins until you come within range. This game is demented. Combat is slow and heavy with melee weapons found in the vicinity making up the vast majority of the game. Pipes, paper cutters, axes, crowbars, sledgehammers, rebar; anything you can get your hands on. You have to time your blocks and swings perfectly to succeed against the insane and just pray they don’t swarm together too often as your taser has to recharge between shots. 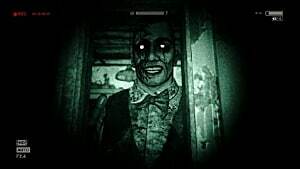 Even your flashlight will vary in intensity based on the creator's designs for the level. And what levels they are. Abandoned malls, hospitals, schools, farms; pretty much the scariest places you would never want to go to. With such a visceral first person view, you can’t help but feel like you’re really there in the midst of such violence. The alleys become suffocating and the tight quarters claustrophobic, but the wide areas offer no alleviation as you realize you’re wide open without cover and could easily be surrounded. You glance left and right through the dark but your flashlight can only shine so far. Most often I would hear something first then get hit, knowing too late I’m being attacked. The soundtrack to this game is virtually nonexistent as the atmosphere and ambience seep into your brain and cause paranoia. Go into the basement and you’ll hear footsteps overhead in the room you just left. Enter a new area and hear hushed voices that fade away when you come near. Objects in the world such as bottles will make noise when bumped into for both you and them, causing tense moments of did-they-hear-me? and what-the-hell-was-that? throughout the game. There are even a few hallucinatory-like moments to add a mind bending psychological aspect that will make you question what’s real and what’s in Ethan’s mind. If you play this game, it will likely be in short bursts with plenty of time between sessions, all the while wondering: why am I playing this? These are the titles that made me squirm, shriek, flinch, and gasp. Some as a child, some as an adult, all of them forever remembered for the sheer sense of dread they instilled in me. Share your own scary experiences in the comments and let's keep Halloween in March alive.